for© sort out the colors from a source of light •uid bend them at different angles, forming a spectrum. Since th© blue waves are shorter than the red, th© blue will be bent least and the red most, the intervening colors coming in their proper order between. Again, we may also have an image formed when the direction AC is such that this difference in phase of the light from successive openings, instead of one wave, is two. The spectrum thus formed is said to be of the second order. When this difference in phase is three waves, the spectrum is said to be of the third order, etc. Plate I, Fig. 2, represents the spectrum produced by a coarse grating. The source of light was a narrow slit illuminated by sunlight. The central image appears just as though no grating were present, and on either side are diffuse spectral images colored as 011 Plate I. Three such images, which are the spectra of th© first, second, and third orders, may be counted 011 the right, and the same on the left. The grating used in producing this picture had about six hundred openings to the inch. Now, a finer grating produces a much greater separation of the colors. The large concave gratings used for the best grade of spectroscopic work produce spectra of the first order which are four feet long. Those of higher order are correspondingly longer. The efficiency of such gratings depends on the total difference of path in wave lengths between the first wave and the last. Thus in the grating shown in Fig. 87 there will be, in the case of the first spectrum, as many waves along AC as there are openings between A and B. If we call the total number of openings in the grating n, then there will be n waves along AC, In the second spectrum, then, since each one of the intervals corresponds to two waves, the total difference in the path is twice as great, so that the number of waves in AC will be 2 n. For the third spectrum the number would be IS ii, and for the mth spectrum run. to get them in their proper position. Very little attention has as yet been directed toward producing a spectrum of a very high order. The chief reason for this is that the intensity of the light in the spectra of higher orders diminishes very rapidly as the order increases. The first spectrum is by far the brightest; the second has an intensity of something like one-third of the first, and the succeeding spectra are still fainter. 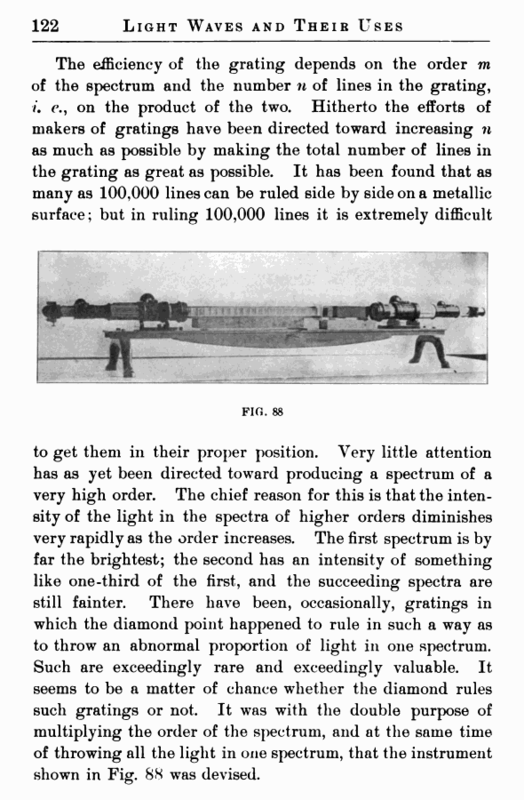 There have been, occasionally, gratings in which the diamond point happened to rule in such a way as to throw an abnormal proportion of light in one spectrum. Such are exceedingly rare and exceedingly valuable. It seems to be a matter of chance whether the diamond rules such gratings or not. 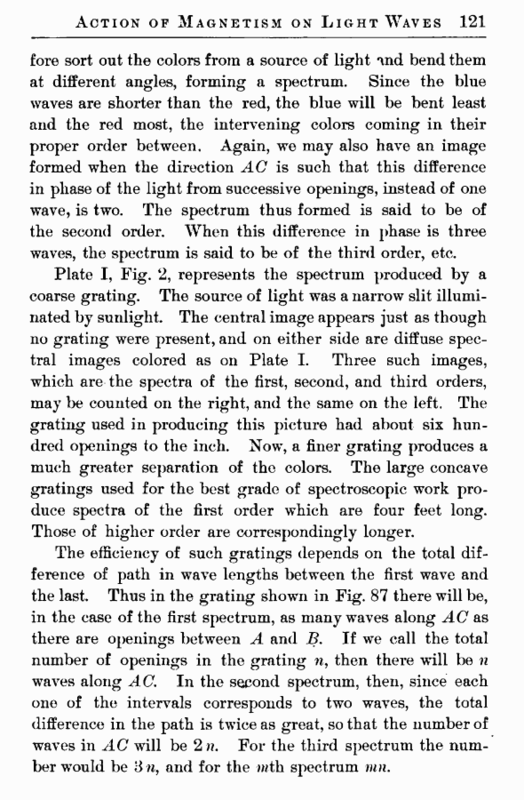 It was with the double purpose of multiplying the order of the spectrum, and at the same time of throwing all the light in one spectrum, that the instrument shown in Fig. 88 was devised.